The original Parmigiana is claimed by three different regions in Italy; the Campana region, which is located in south central Italy, the Sicilian region located off the coast of Italy near the ‘toe of the boot’ and the Parma region which is in Northern Italy. And believe it or not, the original was made with eggplant. Variations of Parmigiana are made with chicken and veal. Today’s Chicken Parmesan is a classic that’s pretty much on every family’s table at least once in a while. I generally serve it over a plate of capellini with a simple tomato-vodka sauce and a sprinkling of Parmigiano-Reggiano cheese. Here’s to Italy! Place each breast between two sheets of wax paper (or in a plastic baggie) and pound with a mallet until thin. Season with salt and pepper and set aside. Prepare capellini as directed; drain. Meanwhile, in a sauce pan, heat 1 tablespoon oil over medium heat. Add onions and garlic and sauté 8 minutes until tender. Pour in vodka and tomato sauce. Stir in basil, oregano, salt and pepper. Bring to a slight boil, reduce heat and simmer. Add the heavy cream and keep on low heat while cooking the chicken. Heat oven to 400 degrees. Place the two eggs in a large deep dish and beat slightly. Combine the bread crumbs and 1/2 cup of the cheese in another dish. In a large skillet heat some olive oil. Dip the chicken breasts first in the egg then in the bread crumb/cheese mixture. Place in the heated skillet and cook 5-6 minutes on each side until browned. Place on a baking sheet and sprinkle with extra cheese. Bake in the oven until cheese has melted. 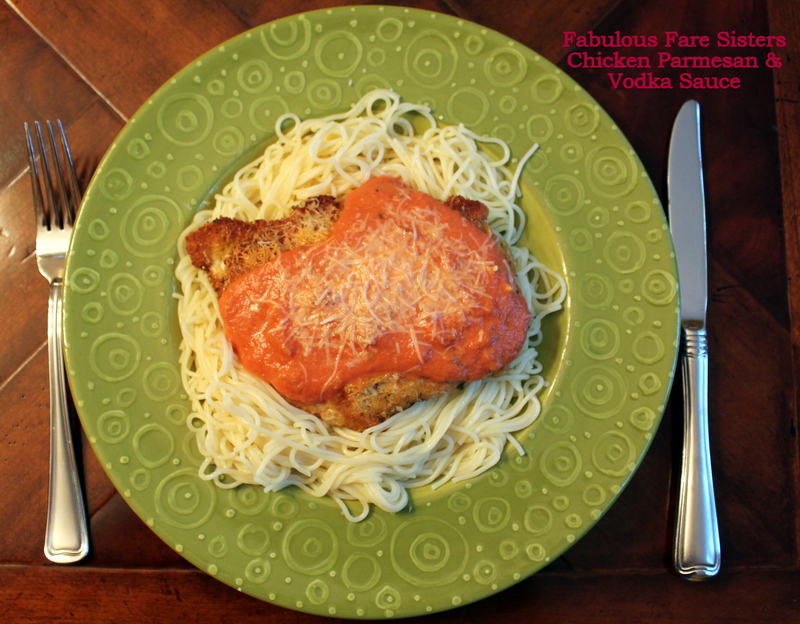 Top cooked capellini pasta with Chicken Parmesan and Vodka Sauce. Enjoy! My daughter’s favorite, I’ll have to try your version for her. You give it a little twist and I like it! N.
oh yes but those are the best!